Untitled (Go-go Dancing Platform) Speaks, 2016, white plinth with light bulbs, voice amplifiers, headphones and performer, 10 mins. 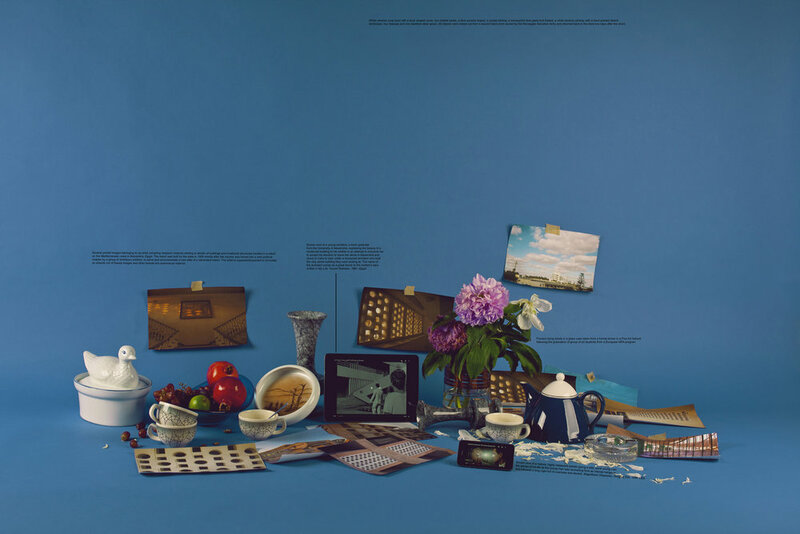 Shown in Frieze Live, London. 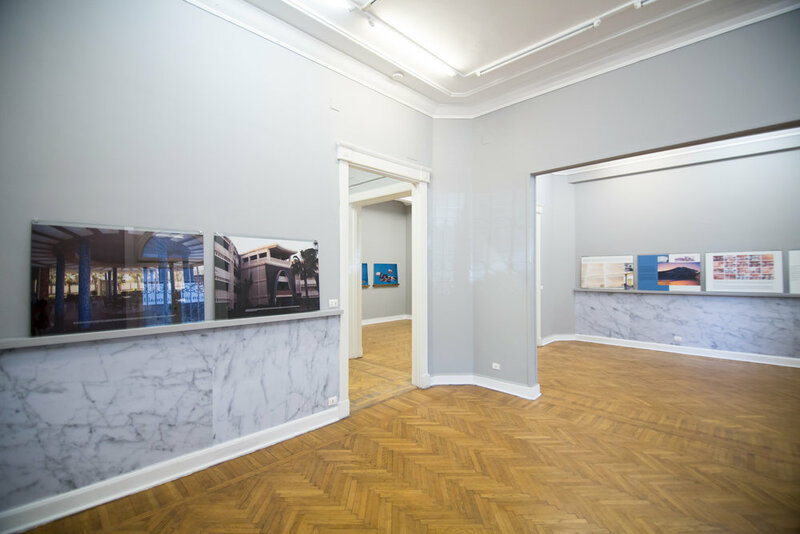 Please Stay Blurry, 2013, Offset print, 100 x 70 cm giveaway poster, edition of 500, wooden rod installed close to the floor. Installation view, Nile Sunset Annex, Cairo, Egypt. Do You Have Work Tomorrow, 2013, Series of 32 screen shots of a staged conversation on an iPhone transformed into Black and White photographs developed in a dark room. 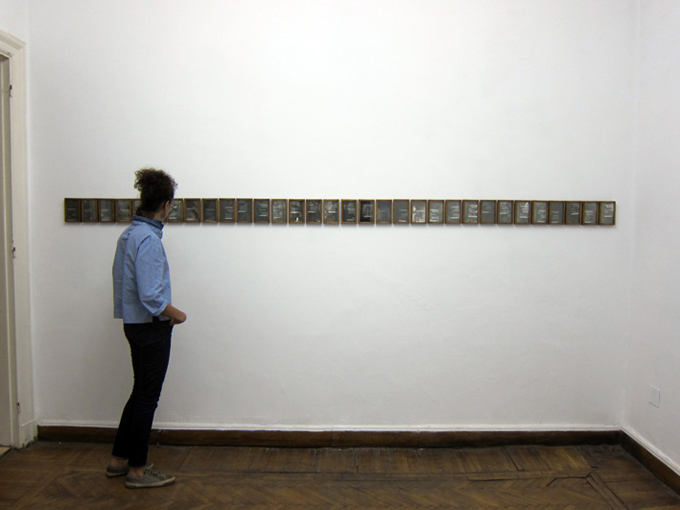 Installation view, Nile Sunset Annex, Cairo, Egypt. Do You Have Work Tomorrow, 2013, Series of 32 screen shots of a staged conversation on an iPhone transformed into Black and White photographs developed in a dark room. 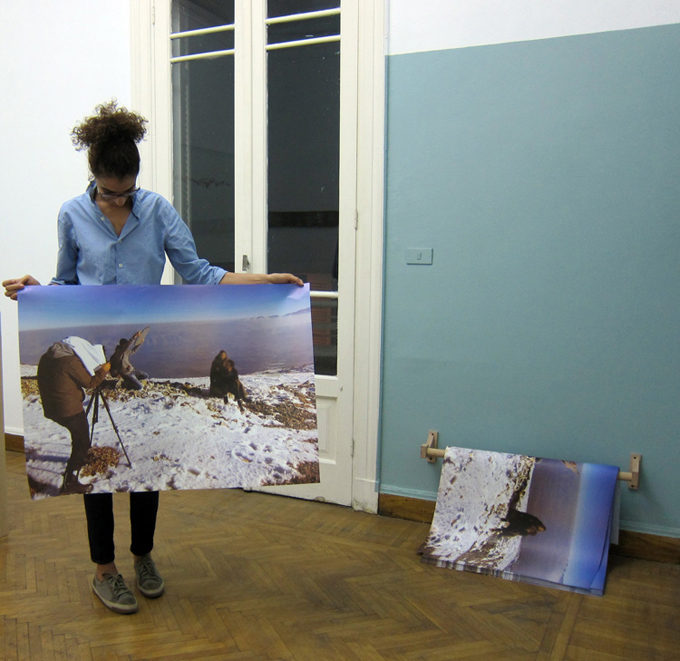 Installation view, Nile Sunset Annex, Cairo. 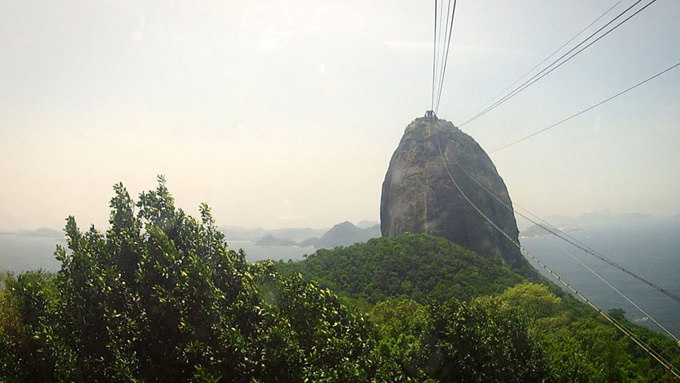 Proposal for a Romantic Sculpture, 2012, Video embedded in a sculpture. Video: 5 min. loop on iPod/iPhone, commissioned tattoo of song title ‘ne me quitte pas‘ by Jacques Brel. Sculpture: 29 x 29 x 100 cm, marble and wood (Photo: GANZEER). Proposal for a Romantic Sculpture, 2012, Video embedded in a sculpture. Video: 5 min. loop on iPod/iPhone, commissioned tattoo of song title ‘ne me quitte pas‘ by Jacques Brel. Sculpture: 29 x 29 x 100 cm, marble and wood. 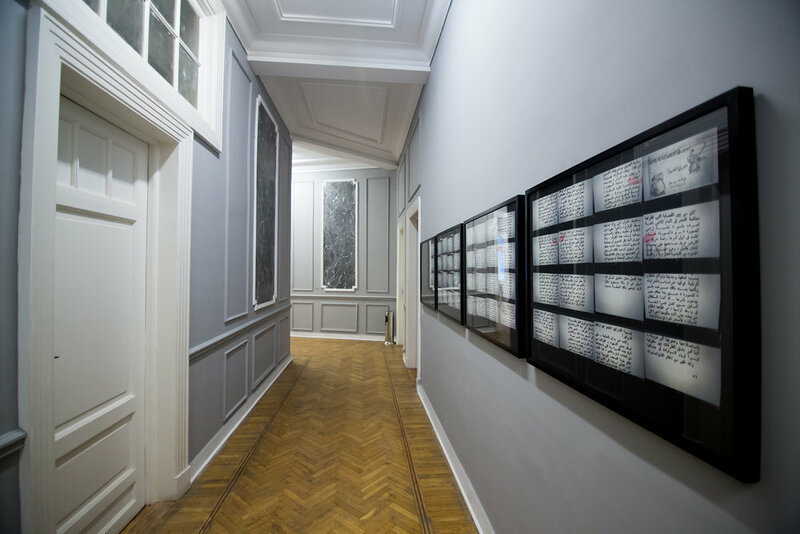 Untitled (Dream), 2012, Inkjet print, 100 x 150cm; Two glass sheets, 110 x160 cm (thickness: 4mm and 6mm); Wooden shelf, 5 x 5 x 165 cm; Hand written sentence by the artist on surface of front sheet of glass. Google Me / Duplicate Self-portrait, 2010, two framed photographs (105 x 75 x 7 cm each), digital collage. Installation view, CiC, Cairo, Egypt. Google Me / Duplicate Self-portrait, 2010, two framed photographs (105 x 75 x 7 cm each), digital collage. The Studio as a Work of Art, 2010, 200 stacked blank canvases. Installation view, CiC, Cairo, Egypt. CAMARADERIE, 2009, HD video 10 min. 30 sec., color, sound, loop using found videos and texts on YouTube. WATCH HERE. As if you weren't in your own Home, 2008, 176 images and 18 typed-out statements,15 x 10 cm each. Installation view, CiC, Cairo, Egypt. 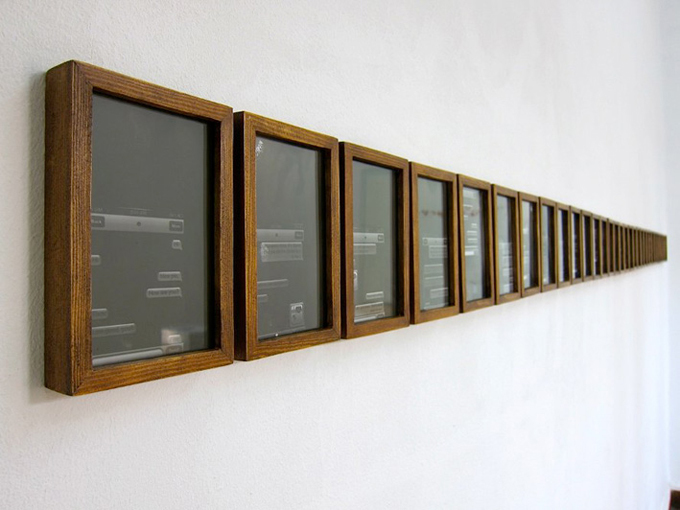 As if you weren't in your own Home, 2008, 176 images and 18 typed-out statements,15 x 10 cm each. MKMAEL Stories, 2007, Book project. Installation view, MAKAN, Amman, Jordan. Painter on a Study Trip (Process), 2014, C-print, 100 x 70 cm. Edition 3 +1 A/P. Installation shot. Mahmoud Khaled, Painter on a Study Trip, 2014. Installation views of exhibition at Gypsum Gallery.